This morning, beleaguered and incompetent White House press secretary Sean Spicer resigned and went off to the great briefing room in the sky in protest of the White House’s hiring of hedge fund guy Anthony Scaramucci as communications director. 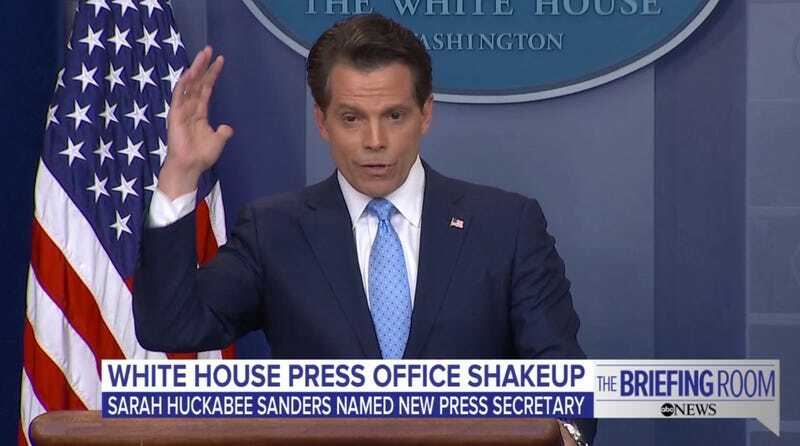 Scaramucci gave his first address to the press today, where he boasted about his new boss Donald Trump’s sporting prowess and composure. If you believe Scaramucci—you shouldn’t—Trump has thrown a perfect spiral through a tire. Scaramucci’s talking about this guy, right?